Home / News / Billionaire Kidnapper, Evans Has Reportedly Vanished From Police Custody! Billionaire Kidnapper, Evans Has Reportedly Vanished From Police Custody! 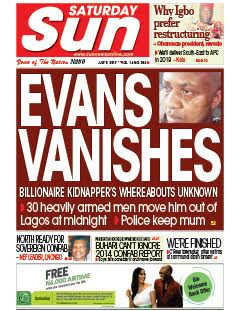 This is strange, according to a report by Saturday Sun, billionaire kidnapper, Evans has vanished from police custody and taken to an unknown location. They argued that he might plot his escape from prison, or get across to some of his members who are still on the run. Their concerns are not far-fetched, given that several inmates in the past had reportedly committed much heinous crimes even while in prison. I hope he is found as soon as possible.